“Kerblam!” earns its titular exclamation point not just because it’s fun to say, but because it’s an episode that takes a familiar Doctor Who format and hits it out of the park. “Kerblam!” is what I like to call a “socially conscious romp,” the sort of Doctor Who episode that balances the fun and worldbuilding of an ensemble-focused base-under-siege adventure with something a little thematically meatier. (Think “Gridlock,” “The Beast Below,” and “The Rebel Flesh”/“The Almost People.”) And while Doctor Who sometimes drops the ball when it comes to handling all of the variables of that tricky structural equation (i.e. “Smile”), “Kerblam!” absolutely delivers. It’s clear from the beginning of this episode that first time Doctor Who writer Pete McTighe has a deep love for the series. The whole adventure kicks off because the Doctor receives a fez ordered by her predecessor (a better call back to that original Eleventh Doctor gag than Steven Moffat ever gave us), and the Doctor also gives a shout-out to the events of the Tenth Doctor’s Agatha Christie adventure “The Unicorn And The Wasp.” But McTighe’s love for Doctor Who mostly comes through in how carefully he seems to have studied the strengths and weaknesses of the past 10 seasons. Most importantly, McTighe gives us a great set of guest characters, which is the single biggest thing separating a good ensemble episode of Doctor Who from a great one. 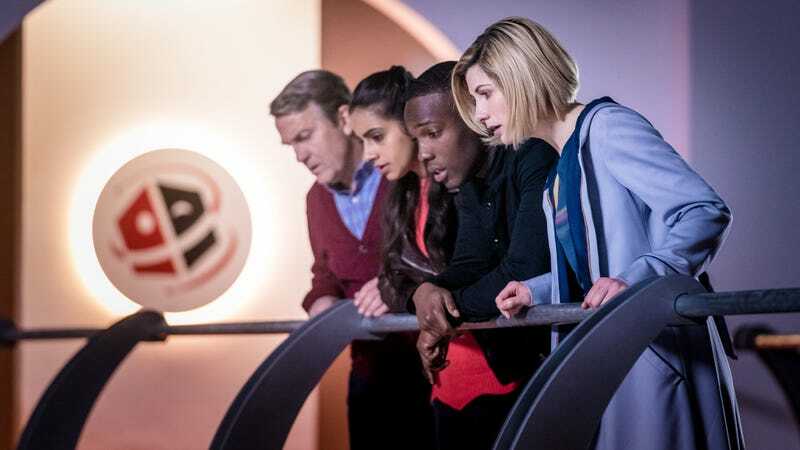 After noticing a call for help inside her fez delivery box, the Doctor, Graham, Ryan, and Yaz go undercover as new employees at the 90 percent automated, 10 percent people-powered company Kerblam—an Amazon-esque e-commerce company with a warehouse that takes up an entire moon. 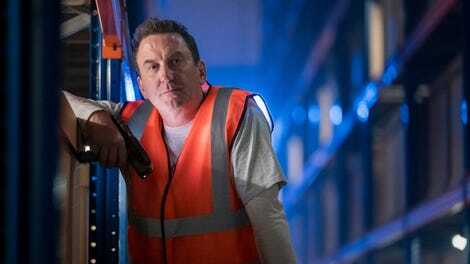 Assigned different jobs within the company, Yaz bonds with hardworking dad Dan (Lee Mack) in “fulfillment,” the Doctor and Ryan are inspired by the optimism of Kira (Claudia Jessie) in packaging, and Graham strikes up a nice repartee with seemingly mild-mannered maintenance worker Charlie (Leo Flanagan). Each member of the “Kerblam!” guest cast feels likable and three-dimensional, even the ones who get the shortest amount of screentime (R.I.P. Dan). And by filtering the episode’s worldbuilding through casual conversations with those characters, the setting immediately feels realistic and lived-in. You only need to compare this episode to something like the vaguely similar but far inferior “The Tsuranga Conundrum” to see the way small storytelling shifts can make a big impact. Befitting the fact that they’ve been traveling with the Doctor for a while now, Ryan, Graham, and Yaz are all more self-assured in their own abilities, and more confident taking the lead on their own investigations. And McTighe has a really strong grasp on our central heroes. Though Yaz’s job as a police officer continues to go curiously under referenced, it’s given subtle nods in the way she’s an active driver in answering the initial call for help as well as in the scene where she bodily grabs a bad guy. Elsewhere, Ryan gets to use his everyday earth experiences—specifically his former job as a factory worker—in an intergalactic context, which is one of my all-time favorite Doctor Who tropes. (Cue Rose Tyler’s monologue about her bronze in gymnastics). And after spending the last episode as more of a passive observer, the Doctor is at her most active this week—standing up against bullies and taking full authority when it’s clear the situation has turned deadly. One of the cleverest things about “Kerblam!” is the way it uses its audience knowledge of Doctor Who tropes against us. Episodes like this one usually end in one of four ways: 1.) the technology is evil, 2.) the corporate overlords are evil, 3.) one of the corporate overlords is evil while the others aren’t, or 4.) the whole thing is some kind of giant misunderstanding. “Kerblam!” feints at each of those as a possibility, with the Doctor regularly questioning the motives of corporate higher-ups Judy Maddox (Julie Hesmondhalgh) and Mr. Slade (Callum Dixon) as well as the seemingly devious robotic “Teammates” themselves (a simple but effectively creepy design). But McTighe pulls a genuine fast one on his audience (or at least on me) by revealing that the episode’s true villain is Charlie—who’s only been posing as a down-on-his-luck maintenance man when he’s actually a radical terrorist who wants to stage a mass killing of Kerblam customers in order to make people distrust automation and return to a workforce of actual people. The call for help came not from an employee, but from the whole computerized System trying to stop Charlie’s plan. It’s one of two big twists this episode delivers. The other even better one is that Charlie’s devious plan involves explosive bubble wrap. Deadly bubble wrap fits perfectly into Doctor Who’s long history of making everyday objects terrifying, but it’s an even more specific nod to the iconic Fourth Doctor adventure “The Ark In Space,” in which Doctor Who’s production team used green bubble wrap as a key part of the design of its alien monster. Needless to say, that episode’s effects haven’t aged particularly well. The fact that this time around it’s actually the bubble wrap itself that’s the danger is a great nod to long-time Doctor Who fans, and another place in which McTighe’s love for the series shines through. The reveal of Charlie’s bubble-wrap-based villainy continues the “mankind is its own worst enemy” theme of the season, and it also introduces the episode’s nuanced thesis: Technological advances aren’t the problem, the problem is people who use and exploit new technological systems for evil. That being said, like a lot of sci-fi-as-metaphor storytelling, I also think “Kerblam!” opens itself up to being easily misinterpreted. To introduce a futuristic Amazon stand-in (a company that reportedly has some very immoral business practices) and then end the whole thing with “the bosses and automation are good—it’s the workers who are evil!” is a little dubious, even if that’s not exactly what the episode is trying to say. There are also some early critiques of Kerblam—Dan’s mention of the “constant random monitoring,” Mr. Slade’s rude treatment of his employees, etc.—that get largely forgotten once the episode delivers the Charlie reveal. Judy’s final proclamation that she’s going to push Kerblam to become a majority organics (sorry, people-led) company has to do a lot of legwork to get us to handwave away those earlier concerns. And while this episode seems to be building a case for the importance of paying people a living wage and giving them a more humane work experiences (again, lessons the real-life Amazon needs to learn), that never really becomes a major focus. Still, after years of training us to see all corporate women as inherently evil (Ms. Foster in “Partners In Crime,” Miss Kizlet in “The Bells Of St. John,” Ms. Delphox in “Time Heist”), I love that Judy really is just a fundamentally decent persona. Julie Hesmondhalgh is a joy to watch throughout this episode, a standout in a hugely strong guest cast. The biggest misstep in this episode is Kira’s death, or, rather, how everyone responds to it. There’s certainly a philosophical debate to be had about whether there’s a moral justification in sacrificing one innocent person in the hopes of saving thousands. But “Kerblam!” doesn’t have that debate, it just takes Kira’s death as a given, with the Doctor explaining the System’s plan to use Kira’s death to change Charlie’s mind, but never actually passing judgment on it. (In fact, the Doctor has a stronger reaction to Slade bullying Kira than to the System murdering her.) The episode also never really justifies why the System doesn’t just kill Charlie, which seems like the much simpler plan. The Doctor mentions that the Teammate in Slade’s office was there to stop Charlie, but why did the System give up so easily? And why wasn’t anyone more upset that Kira died for nothing, given that her death didn’t even inspire Charlie to have a change of heart as the System hoped it would? Technically, it’s the Teammates who fridge Kira to motivate Charlie, rather than the episode itself doing the fridging, but at some point that distinction feels a bit like splitting hairs. The darkness of Kira’s death is easy to overlook in the otherwise enjoyable twisty, turny rush of the episode’s ending. But that—coupled with the potential for the episode to be read as “corporations are good, young people who want good working conditions are bad!”—is what holds “Kerblam!” back ever so slightly. That being said, Yaz’s unexpected request to visit Dan’s daughter was a lovely bit of emotional depth at the end of the episode. And on the whole, “Kerblam!” is such a zippy, energetic, (mostly) thoughtful bit of fun that it’s hard to care too much about its missteps. Chris Chibnall’s run of Doctor Who is clearly making its strongest mark in its historical episodes. But it’s nice to see that this era of the show can also deliver a classic Doctor Who adventure done really, really well too. The Doctor’s initial delight over receiving a Kerblam delivery is such a great way to bring us into this episode. It establishes Kerblam as a known entity, while leaving the specifics of how the organization actually works as something to be discovered. There’s sharp direction from Jennifer Perrott throughout this episode, and I particularly love the way the ankle bracelet “group loops” appear as tiny bright lights in the dark dispatch center. It feels like the show is handling Ryan’s dyspraxia in name only (“I can’t do it.” “Yes you can!” seems to be the extent of the exploration of his condition). But I would love to hear from those who actually have dyspraxia about how they feel about the representation! Ryan, Yaz, and Charlie’s big adventure through the conveyor belts of Kerblam’s dispatch center was a whole lot of fun and way better than Attack Of The Clones’ attempt to do the same. Ryan’s fake laugh at Graham teasing him about his romantic awkwardness is maybe my favorite thing Tosin Cole has ever done on this show. Does anyone else think Leo Flanagan looks like he could be Timothée Chalamet’s older brother? Everything about “generation one” Kerblam delivery robot Twirly was perfect, and I want one.